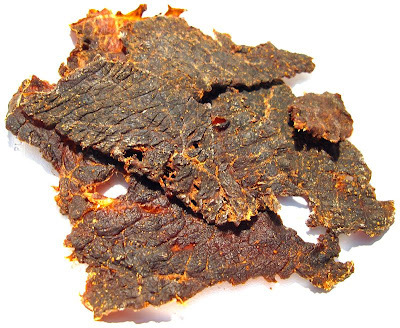 Fatman's Beef Jerky is a brand of Red Meat Foods, LLC, based out of Roswell, NM. I had reviewed several of their beef jerky varieties about a year and a half ago. Since then, Rick Robey, the guy behind the brand, released a few more flavors, a Sweet & Spicy, a Barbecue, and this Cajun. You can read my previous reviews of Fatman's here. Prior to launching Fatman's, Rick Robey owned and operated a holstein calf raising business for 30 years as well as a USDA inspected packing plant. All of his jerky is made from inside rounds of American-raised beef, marinated for 24 hours in Robey's own homemade recipes. He makes all his jerky in his own USDA inspected facility. Beef, water, soy sauce, worcestershire sauce, vinegar, cajun seasoning, cayenne pepper, salt, flavorings. The first thing I taste from the surface of these pieces is a light saltiness. After sucking on a piece for several seconds, I can feel a faint spicy tingle. The chewing flavor starts with some natural meat flavors. There's a stronger spiciness now, a little stronger saltiness. As for being marketed as a "Cajun" beef jerky, it seems to hold up to that description. I do pick up a fair amount of spiciness in that I feel some heat in this. I can also pick up a seasoning flavor, mostly through a light bit of garlic and a light bit of that cayenne/red pepper. But overall, the cajun seasoning is light on flavor, and a bit stronger on heat. And as for that heat, I'd rate this on my hot scale as medium. Those of you with lesser tolerance for hot foods might see this as medium-hot. I also pick up a fair amount of natural meat flavor. Like I reported in my other reviews of Fatman's, it has that flavor reminiscent of the center portion of prime rib. I don't really pick up any smokiness. As for the what flavor dominates this jerky, it seems to be a 50/50 split of the natural meat flavors and the cajun seasonings. Both are equally noticeable. The cayenne/red pepper heat is also well noticeable. The level of saltiness in this seems light overall. This is a dry jerky, with a dry surface feel. They don't have much flexibility, any amount of bending will cause it to crack. The pieces are easy to tear apart with my fingers, and chewing seems easy as well. The chewing texture starts out feeling dry and brittle. In fact, the initial chewing reveals some crunchiness. 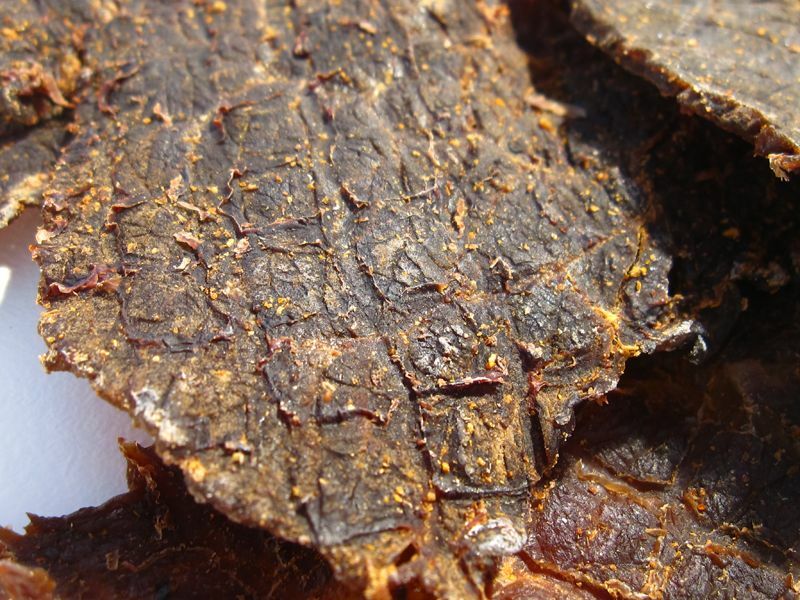 The jerky seems to chew down to a soft mass relatively quickly. By that time, it can feel either steak-like, comparable to one cooked well-done, or quite crumbly. The more crunchier the jerky, the more crumbly it ends up feeling. I don't see much visible signs of fat, but I do see some small streaks of gristle. But because this jerky is sliced thin, I don't really feel the gristle when I chew. There's also a fair amount of stringiness noticeble when I tear pieces apart, but again they don't show much in the chewing due to thin sliced nature. Fatman's sells this Cajun Beef Jerky from its website at a price of $28.00 for a 1 pound package. Add to that shipping fees of $5.15 (if shipping to Southern California), for a total of $33.15. That works out to a price of $2.07 per ounce. For general jerky snacking purposes, at the $2.07 price per ounce, this jerky provides a good value. I'm getting a decent amount of snackability from its good overall flavor, easy eating, and good chewing texture. It's priced just a little bit higher than the major brands found in grocery stores, but it's provides a better flavor and consistency. As a Cajun beef jerky, at the same $2.07 price per ounce, it's a decent value. I do get a light spiciness in terms of a garlic and cayenne seasoning blend, and I get a fair amount of heat as well. It seems to provide a satisfactory cajun experience for the price you're paying. 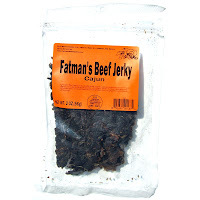 This Cajun variety from Fatman's Beef Jerky provides a decent cajun flavoring both in terms of a combination of garlic and cayenne pepper seasoning and a fair amount of heat. Add to that some natural meat flavors and you get an enjoyable jerky. It's also easy to tear apart and chew. But the chewing texture can vary from feeling like a well-done cooked steak, to something very crumbly. The drier and more crunchy the jerky, the more crumbly it feels. But while I said this has a good overall flavor, I didn't find it to excite my senses, not enough to get it up into that "Best" rating. But it's still quite snackable, and good enough to keep me reaching for more. For my recommended beer pairing, this needs something with a lot of body, go with something heavily malty, try a smoky porter like the Stone Smoked Porter, or a double IPA, like Grand Teton Brewing's "Lost Continent".